The Global Set Top Box (STB) Market size was estimated at USD 17.14 billion in 2015 and is anticipated to reach USD 29.78 billion by 2024. The market is expected to witness significant demand over the forecast period on account increasing penetration of High Definition (HD) channels among consumers and the rising adoption of smart TVs. Increased the storage space in modern Set Top Box (STB) devices to enable caching of data broadcasts and improved personal video recording. 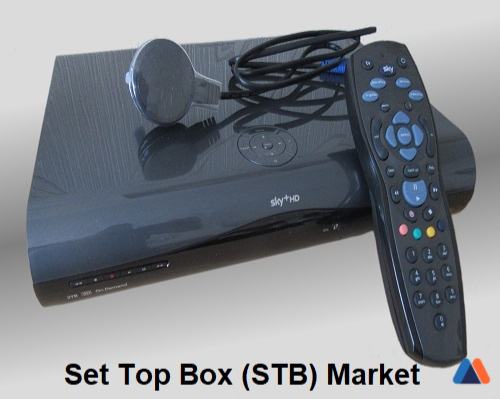 Increasing demand for high-quality picture and sound coupled technological advancements are anticipated to fuel the Set Top Box (STB) market over the forecast period. Key players in the market include digital satellite providers, cable providers and telecommunication companies. Major infrastructural providers are undertaking strategic partnerships and mergers with content and software providers on account of increased need for better interactive content. This has enabled seamless interactive content for consumers. Major infrastructure providers include Ericsson, SysMaster, Cisco, IBM and Elitecore. Regional content for the rural consumers and higher volume of 3D content creation for urban consumers as a result of digitization is expected to augment market growth. Further, it is expected to fuel demand for HD and 3D TV sets. Consumers are accessing high-quality picture and sound and installing set-top boxes and with the digitization of cable. The TV screens are getting bigger and better thereby making SD quality undesirable for a high-quality viewing experience. The global market is anticipated to present considerable opportunities for market growth over the forecast with the rise of innovative products including, 4K UHD TVs, 3D smart interactive TVs and OLED TVs, years. These devices enable users to access HD quality video content on their HD-ready TV sets. Technologically-advanced TV sets and increased demand for smart TVs among the global population is gradually increasing the need to access innovative features. Manufacturers provides several variants including cable-based, IPTV, satellite, Digital Terrestrial Television (DTT) and Over the Top (OTT). In 2014, DTT is anticipated to remain the leading set-top box system over the forecast period, which accounted over 25% of the global industry. Satellite system sends signals received by satellite version and converts it into analog format for viewing on TV sets. Consumers require the subscription to a particular satellite pay-TV operator to use satellite STBs. Emergence of quality standards coupled with the computational capabilities of devices to meet increasing consumer expectations have resulted in the growth of STB market globally. Migration from DOCSIS 3.0 to advanced DSL standards including vectoring and G. fast coupled with the proliferation of technology, is anticipated to offer opportunities for market growth. Global STB industry was dominated by High Definition (HD) Set Top Box (STB) devices and is expected to replace the traditional Standard Definition (SD) devices from 2016 to 2024. HD devices are projected to constitute over 60% of the overall industry revenue share in 2014. High-quality sound output and HD transmission devices provide high resolution (over 1080p) of video content transmission. Therefore, these technologies have gained increased preference among TV users over the past few years. Service providers are introducing 3D and Ultra HD (UHD) STB devices compatible with 4K and 3D televisions and are gaining momentum in the market. North America is anticipated to experience growing demand for Internet Protocol TV (IPTV) STBs on account of rising high-speed broadband infrastructural support and the customizable features it offers to its users. In line with the energy efficiency concerns, producers are inventing new methods to add a lower sleep type mode that is available in several consumer electronics similar personal computers. The regional market for STBs is expected to grow at a CAGR nearly 2.5% from 2016 to 2024 primarily driven by the rise in the sales of low-cost cable, DTT and satellite DTT. The Asia Pacific STB industry is expected experience rapid growth owing to encouraging government mandates and growing consumer adoption in the region. Increase in the overall sales of such products has resulted from declining prices of TV sets. Key market players include Amazon, ADB, Cisco, Echostar, Coship, Huawei, Samsung, HUMAX, Technicolor and Skyworth. Vendors are focusing on product differentiation and integrating supplementary features in their products.